A persistent area of counter-clockwise winds emerged a couple of days ago, and continues to swirl off the east coast of Florida. It contains a surface low-er pressure area and numerous thunderstorms on the southern side of circulation. Rain chances will be normal throughout this week, especially early in the week. 40-60%. These may increase IF this system moves closer to Florida than the models currently show. If this system becomes too strong, rain chances may actually decrease on the west coast and into south Florida mid week. 4th of July plans may be a jeopardy on the South Carolina coast and in eastern North Carolina. Stay tuned…don’t change your plans…but be prepared. The above loop is from earlier this evening before sunset. This area is being watched as Invest 91L by the National Hurricane Center, and it has an 80% chance of becoming a tropical cyclone before July 4th. The requirements (generally) of becoming a tropical depression are that there has to be a low-level closed center, better than 50% coverage of thunderstorms over the center, generally lower pressure than the ambient pressure, and breezy to gusty conditions. Three of those conditions have been met. I am still waiting to see better thunderstorm coverage over the center of this system. I would much rather know that there is plenty of thunderstorm coverage and not know if a low-level center is present, but what we have is the opposite. 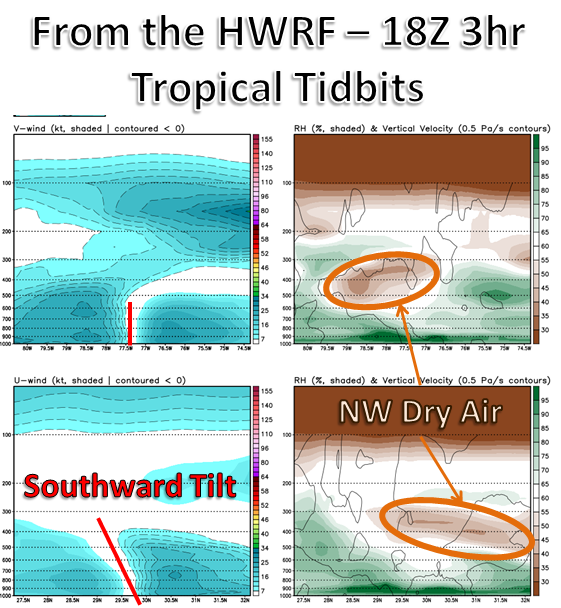 This problem is a bit harder to fix by tropical cyclones. Why is all of the thunderstorm coverage to the south? Just a little bit of dry air and just a little bit of NW shear. I believe both of those will abate enough to continue organization within 48 hours, but I also think that even with those two negatives slow development was likely to occur. Plenty of warm water and moist air will allow for slow development. Where is it going and how strong will it get? It is entrenched in the summer time Bermuda high, which has been pinched off and shoved into the Gulf of Mexico. That high pressure system will push 91L to the south for another day or so before it gets picked up by an incoming trough to the west and north. There were a few Tropical Overshooting Tops to the south and east over the last couple hours, which will sustain this system. Diurnal effects plus very warm waters in the Gulf Stream should allow this system to become a moderate tropical storm within the next 72-96 hours with moderate confidence. The stronger this system gets, the drier most of Florida will get, with the exception of NE FL/GA due to dry air coming in from the Appalachians. Be prepared to possibly change your July 4th plans in the eastern Carolinas. Marine activities off the coast of the southeastern US should be evaluated. 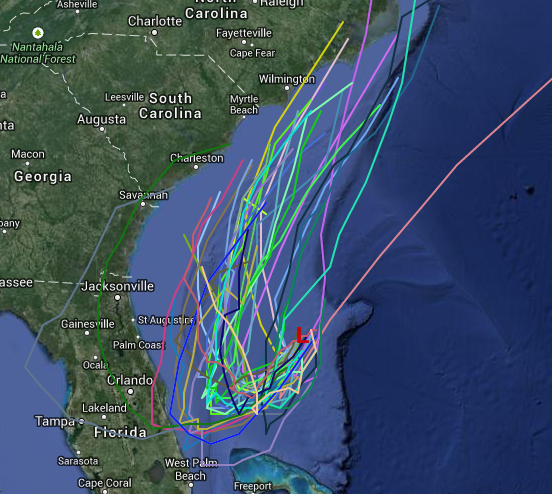 A moderate tropical storm could be off the coast of the SE states this week…the name would be Arthur. Stay tuned here and @JonathanBelles on Twitter. Posted on Sunday, June 29th, 2014, in Florida Weather, Tropical Weather. Bookmark the permalink. Leave a comment.